I am currently a software engineer on the Google Surveys team, which provides a platform to get opinions from the internet population. My previous team at Google was Google Shopping, or Product Listing Ads (PLA). I was on the UI team, where we were responsible for the product ads shown on google.com. 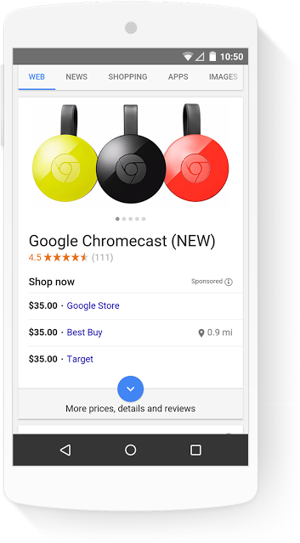 If you've ever searched for a product on Google, you've seen the shopping ads. One of my biggest launches was a revamp of the product entity card (see image). How are people's interests related? By exploring people's interests from LinkedIn profiles, we have created an interest graph to understand these relationships. 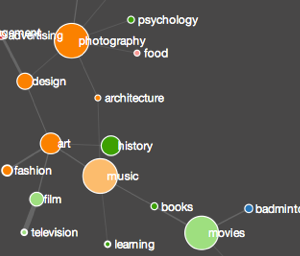 The graph nodes are interests (hiking, painting, design), color-coded by category. Links between nodes appear when interests co-occur in multiple profiles. By looking at the graph, we can see which interests are more commonly shared among people, and whether these interests are in the same category (that is, similar to each other). This allows us to form hypotheses about how and why certain interests co-occur more often than others, and measure the diversity of a person's interests. Sherwin Wu created the network visualization. See it in action here. 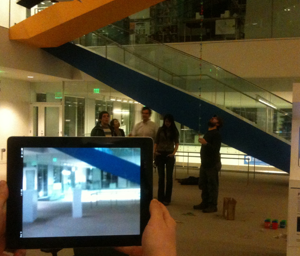 This was my thesis for my Master's degree from the MIT Media Lab. What if you could see what the past looked like from where you are standing? What if you could relive any event that happened at your current location? Rather than just reading about an event, we want to be immersed in it and experience it ourselves. Ghosts of the Past allows you to create, save, and geotag panoramic canopies. Anyone who subsequently visits that space can see what you have seen, joining with you to create time-lapsed socialization. Since each canopy is time-stamped and geotagged, it gives the user an anchor in space while they explore history. Any event, special or mundane, can be captured for anyone in the same location to view. QR codes are posted in building locations with an active canopy. My collaborator Dan Schultz also describes this project on his website. Buildings consume more than a third of the energy used in the United States, but most people have no sense of how much their actions can affect a building's energy use. We are testing the hypothesis that if people have a convenient way to record their energy use and learn ways to improve it, they will change their habits. We have created visualizations of HVAC use throughout the Media Lab to test this hypothesis in a large-scale space. The system uses touch-screen networked displays strategically placed throughout the building to convey real-time and historical temperature and thermostat settings, and ultimately electric usage. 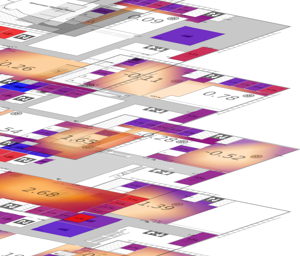 Not only can people see a heat map of their lab area, they can also observe trends and compare their energy usage to those in other areas. This project builds a social, location-based information window into the Media Lab using 30 touch-sensitive screens strategically placed throughout the physical complex and at sponsor sites. The idea is get people to talk among themselves about the work that they jointly explore in a public place. 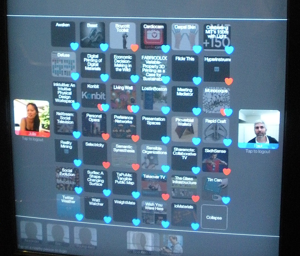 We present Lab projects as dynamically connected sets of "charms" that visitors can save, trade, and explore. The Glass Infrastructure demonstrates a framework for an open, integrated IT system and shows new uses for it. More information about the Glass Infrastructure can be found here. Online games bring geographically separated people together in a virtual world. Board games bring people together in the physical world. QRtcullis is a game that does both. It is a location-based, multi-player, social game that can be played on any smartphone, tablet, or computer. 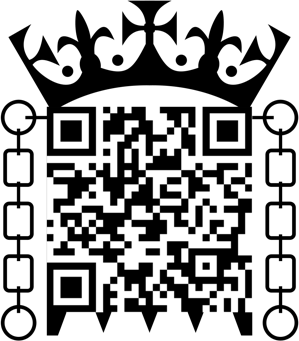 It is a remix of the fort-explorer genre, updated to have a connection to the physical world through QR code-based markers. Play can be affected by real-world environment factors. Each fort can be populated with various objects that either help or hinder other players. Completing the fort may require solving a maze or other puzzles, answering riddles, or finding answers to questions about the real world. The goal is to find and complete as many forts as possible. QR codes will be placed throughout the Media Lab and on a screen in the Viral Spaces area where you can see and interact with all the players.